Enova Hosts Event for Chicago Chapter of Global Non-Profit - Enova International, Inc. 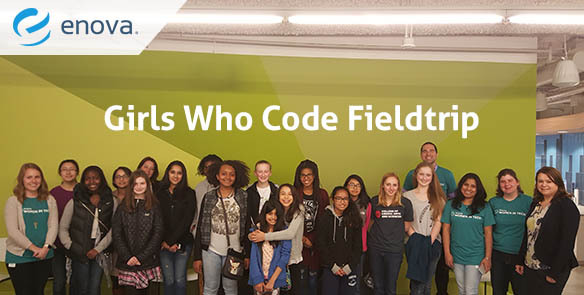 This past month, Enova’s corporate office was the destination for a Girls Who Code field trip. Enova coders had the privilege to meet with the young women of the Chicago chapter. Members ranged in age from 6th grade through senior year in high school and from all over the Chicagoland area. As women in the coding world, we are familiar with the challenges of coding, as well as obstacles of working in this male-dominated field. We were excited to share our experiences with the girls and hear more about their interest in the coding world! After we gave the girls a tour of our office, Enova employees were able to meet with the girls and dive deeper into topics relevant to these future coders. Nicole Frapolly, Data Services Manager, addressed what it was like to be a female engineer. Starting her career as a Full-Stack developer, she realized her true passion was data, and she pressed forward to make that transition happen. She encouraged the girls to continue learning and never let anyone tell you to stop. “You may not be perfect – no one is. The important this is to find the one thing that drives you and follow that passion,” said Frapolly. Lahari Manam, Manager of Software Engineering, discussed the multi-faceted aspect of what coding can do: coding is fun, inspires creativity, sharpens problem solving, encourages one to be resilient to failures and introduces you to many sides of technology. In short, coding helps you learn how to learn. Eric Brooke, another Manager of Software Engineering, took the time to describe the benefits of a career in software engineering. Eric’s favorite: versatility. You don’t know what you will be doing 10 years from today. Griffin Caprio, Director of Technology, discussed what he would do differently from when he was 16. He confessed that even though adults act like they know what they’re doing, we don’t. Being successful is about being confident in yourself, and figuring it out along the way. We’re all working to be our best selves, so it’s crucial that we encourage each other rather than put yourself or others down. We’re excited for the next group of girls who can visit our office and share their growing passion for coding with us. For more on Girls Who Code and how you can get involved, visit their site. A special thanks go out to Anna Cillan, Christine Schwerdtfeger, Julie Fouts, Lauren Tafoya, Priyanka Prakash and Valerie Concepcion.